The Defender from Kustom provides an intoxicating blend of hot tube amp tones and never-before-seen features. 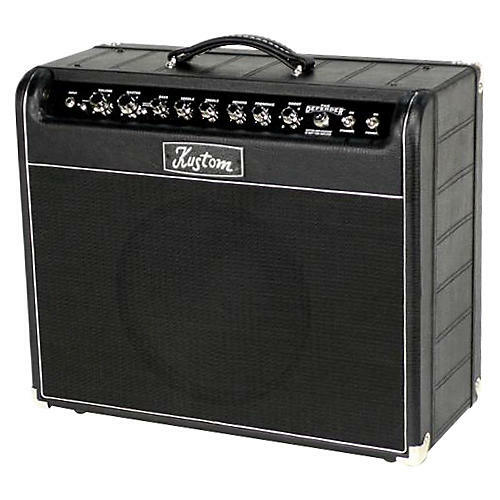 To maximize the amp's classic tone, The Defender is built of solid Pine and uses a Plywood Baffle Board. All-Pine construction gives the amplifier a rich, resonant tone that will inspire any lover of historic tube amps. The cabinet is covered in high-quality black Tolex with a raised stitching pattern, similar to a motorcycle seat. An exclusive preamp operates unlike any other. Called Duo-Mod, the proprietary Kustom circuit uses traditional Volume and Master Volume controls, but that's where the similarity ends. Here's how it works: When turning the Defender's Volume control down to get cleaner tones, the Duo-Mod circuit progressively reduces gain in multiple locations throughout the preamp. The result is stunning clarity throughout the Gain control's entire range. In other words, clean tones get cleaner and medium-gain tones stay chunkier and dynamic, while not sacrificing their higher-gain potential. In the medium-to-high gain ranges, the Kustom Duo-Mod circuit progressively adds gain in multiple locations throughout the preamp. The result is smoking hot rock tones with punch and clarity that set it apart. In essence, the Kustom Duo-Mod circuit produces a wide variety of tones from a deceptively simple one-channel amplifier without the need for additional gain switches or controls. The Defender's Master Volume doesn't merely control the overall amplifier level. The guitar amp also optimizes the amp's overall EQ to produce perfectly tweaked tonal results no matter how the input Volume and Master Volume controls are set. For example, when the input Volume is cranked for distortion and the Master is set lower, the amp's midrange and high-end are adjusted to eliminate any harshness. This system lets players make large changes in gain settings with minimal adjustments of tone controls. For added flexibility, the Defender amp also has a Master Volume Bypass switch, which lets players entirely disable the Master from the circuit to achieve the penetrating tone and headroom of vintage, non-Master type amplifiers. It's perfect for players who like to use outboard overdrive and distortion boxes to spice up their sound. For even more power amp gain, a variable Power Amp Boost control provides up to 10db of footswitchable volume that is perfect for making guitar solos stand out in the mix. Amplifier features include two EL34 output tubes, three 12AX7 preamp tubes, a 12-inch Kustom speaker and a Bright switch that provides either a fuller, American-style bass response or a tighter, British flavored low-end. A player's preference of either EL34 or 6L6 power tubes may be used in The Defender, thanks to a switch which adjusts the amp's bias circuitry accordingly ” perfect for guitarists who like to experiment with their tonal options. A classic spring reverb circuit provides everything from a warm, ambient effect to an all-out cavernous wash of sound. 3 year parts and labor warranty on all amps, PAs, and speakers, including speaker cabs.